I’m living now on Milan’s south side, in a room I’ve rented from a guy who posted his advert in the website Easystanza.com (a nice suggestion for those looking for temporary residence in town), reasonably central, close to the XXIV Maggio Square and to my lessons, at Scuola Leonardo Da Vinci. And also nearby there’s a zone of Milan, the Navigli, that gets very busy during the summer. As the very important city it was, Milan required a port to improve the commerce. During the 12th century construction began of the Grande and Pavese canals, the Navigli, which connects the Ticino River and the Maggiore Lake. I was told that there were several other canals all over Milan and that they were land-filled during the WW II to allow the transit of the war tanks, but also for hygienic reasons. I also heard that there’s a project for resurrecting them for the 2015 Milan World Exhibition. Anyway, nowadays there are only this two Navigli and the Darsena (that connects both). I recommend the bar ¡Mas!, at the Naviglio Grande, with a amazing buffet, tables and sofas just by the canal and a competitive pricing policy. The first pint (San Miguel and, unfortunately not Foster’s, which reminds me London’s Soho) costs 8€, but from the second on, you pay only 5€ (yes, expensive, but that’s the regular price over here… another reason I miss Soho and the £3.30/pint!). Be careful because some new waiters may not includethe discount on the subsequent pints. During August, the official Italian holiday month, Milan is a ghost (and hot!!) town with all the shops closed and the Milanese heading to the beaches. 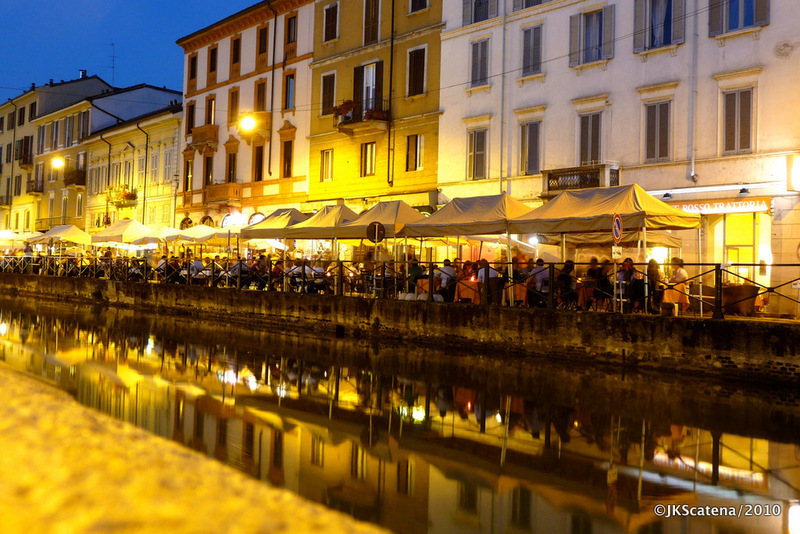 All you can do is head to the Navigli which stays busy during this month. *Language Comment: in Italian the plural is not as in English, or even Portuguese, where all you need is an ‘s’ on the end of most of the words. Here the rule for masculine words, finished with an ‘o’, they get the plural form by changing it for an ‘i’; the feminine words, finished with an ‘a’, change for an ‘e’. So, you have a ragazza (lady) and many ragazze (ladies); a macchina (car) and two macchine; one ragazzo (guy) and several ragazzi (guys) etc. Of course you’ll find some exceptions. Anyway, this post’s title is about the summer (Estate) at the canals – Navigli (plural of Naviglio, canal) – Grande and Pavese and the (many) Aperitivi.